How can you add an addition to your home using space you already have? Sound like a trick question? It’s actually true, you can add an addition using only the space you have in your home. How? In your attic! 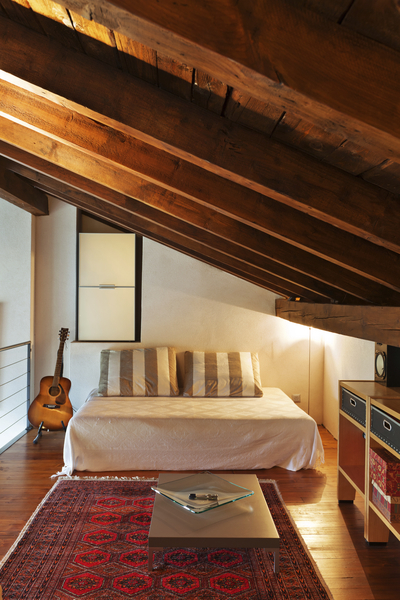 Though you won’t have to worry about the same magnitude of code requirements you would if you were adding a totally new addition, there are still some requirements you’ll need to meet for an attic bedroom. A general rule is that the ceiling must be at least 7′ 6” over a floor area of 70 sq. ft. at least. You must also have a staircase to the level below, as well as a window large enough for a person to exit from in the event of an emergency. An escape ladder (which can be stored in a closet) is also necessary for this purpose. You’ll also need to evaluate your attic to determine if a bedroom would be practical in terms of size, plumbing, HVAC, and electrical requirements. Architects, electrical, plumbing, and HVAC contractors can help you determine if installing a bedroom would be feasible, and can give you estimates as to costs. Because attic bedrooms are usually located above second story bedrooms, soundproofing is necessary to prevent the sound from either bedroom from bothering the occupants. This can be accomplished with a number of methods, from installation of another layer of subfloor to installing carpet with thick foam pads underneath. Storage is already generally limited in an attic bedroom, so innovative solutions are required to get the most out of this space. Window seats are a great way to add storage space by opening up the space under the seat for storage. This entry was posted on Thursday, September 18th, 2014	at 9:25 pm	. You can follow any responses to this entry through the RSS 2.0	feed. Both comments and pings are currently closed.